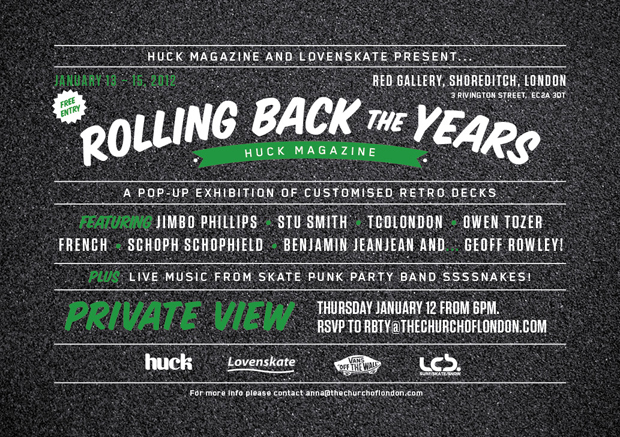 Huck Magazine get together with the folks at Lovenskate for a skateboard art show at East London’s Red Gallery this week. Rolling Back The Years is a pop-up exhibition of old-school skate decks, each customised by a different artist. The exhibition will feature artwork by Jimbo Phillips (son of the legendary Jim Phillips, responsible for some of the most iconic skateboard graphics of all time), UK artist French (the main man at Witchcraft Hardware), Stu Smith, TCOLondon, Owen Tozer, Schoph Schophield, and Benjamin JeanJean. In addition, the show will also feature an installation by British skateboarding legend Geoff Rowley. The exhibition will house a pop-up shop run by LCB Surf Store, and those attending Thursday’s launch will be entertained by Swansea skate punk bankd SSSSnakes. RSVP to TCOLondon to be there, or check it out any time this Friday/Saturday/Sunday. Big things for the british skate scene at the moment, all hall Blacksmith’s arrival when they get it together.